Last Friday, the webpages at PokerStars.com and FullTiltPoker.com were replaced with the following image. Shortly after that, Americans were no longer able to play poker on these sites. Regardless of the immediate outcomes of this event, and regardless of the eventual future that online poker will have in the U.S. and in the rest of the world, this destructive change marked the sudden and immediate end of the first era of online poker. After my dozens of hours of wading through online discussions over the past several days, I have been at a loss for what to say regarding what the poker world is calling "Black Friday". I don't have anything valuable to add to the ongoing community conversation for now, so I've erred on the side of staying quiet so as not to add to the chaos. Nonetheless, I wanted to at least provide a brief summary and a few thoughts, mostly for the benefit of my personal acquaintances who may not be familiar with poker, or who may not have followed this particular issue closely. Since I have this blog, I might as well put it here. It won't be anything new for anyone who has been following the forums. This is the biggest news in poker history, and the biggest damage ever done to the entire game's economy. It may even be the single highest-impact adverse event in the history of any competitive game. Friday afternoon, the Department of Justice unsealed indictments against individuals associated with the largest U.S.-facing online poker sites, including PokerStars and Full Tilt Poker. These sites served only as a venue for players to play poker against each other, and they did not offer any casino gambling. The charges against the sites include both illegal gambling charges and bank fraud charges. In response to the indictment, these sites blocked U.S. players from depositing, withdrawing, or playing in their games. Since 2006, there was a reasonable probability that the DOJ would take an action like this at some point. It was more of a matter of when it would happen, rather than if it would happen. No federal law addresses online poker, though some outdated laws cover sports betting or general gambling games played against the house (rather than between players). The DOJ has felt for years that online poker is illegal under these existing laws, and they have been alone in this assessment. The UIGEA, passed in 2006, did not change the legality of any form of gambling and failed to provide a framework with which the DOJ could actually prosecute poker sites. 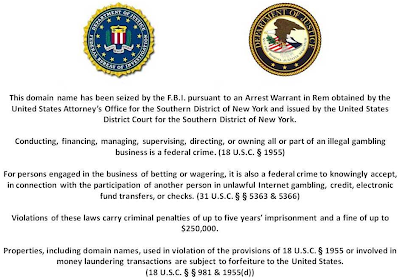 However, this law, which targeted banks and other financial intermediaries that dealt with illegal gambling websites, allowed the DOJ to go after the processing of deposits and withdrawals for poker sites. For most major banks, the threat that poker sites might be considered "unlawful online gambling" and that servicing them might attract the costly attention of the DOJ was enough to make it a bad business decision to accept such transactions. Thus poker sites that continued to serve the U.S. were inevitably destined to work with increasingly less reputable banking partners. At some point, the DOJ was bound to have enough information to make some claim against the poker sites under the broad classifications of money laundering and/or bank fraud. That is the nature of the bank fraud charges in this indictment. Aside from the alleged bank fraud, which presumably became necessary in order to continue to serve the largest poker market in the world, PokerStars and Full Tilt Poker are reputable, legitimate, global companies. They are explicitly licensed in every country which provides licensing for online poker; the sites would be happy to pay U.S. taxes in exchange for the benefits of U.S. licensing, but the U.S. still has not established a licensing framework. The sites operated in the U.S. under strong legal opinions that peer-to-peer strategy games like online poker do not constitute illegal online gambling. If they can demonstrate that the business of offering online poker to Americans does not constitute illegal online gambling, the bank fraud charges may not apply. It's complicated. While I generally trust in PokerStars and Full Tilt Poker, I do not support their misrepresentation of their transactions to banks, if the allegations are true. Nothing has changed with regard to the legality of online poker for the player. American players are not targeted in any way in this indictment, nor under any federal laws. Even the DOJ agrees that playing online poker does not violate any federal law. All of the laws at play here are those which target only businesses that operate or profit from "illegal gambling". Despite the fact that the players have broken no laws, their account balances with these sites are currently inaccessible. The sites will attempt to return U.S. players' funds as soon as they are able, but presumably, with an ongoing investigation into allegations of bank fraud in the U.S., the sites are having trouble initiating any further financial transactions in the U.S.
PokerStars and Full Tilt Poker were the only licensed and reputable online poker sites that were willing to accept American players amid the country's ambiguous legal landscape. Other smaller sites continue to serve the U.S., but are neither safe nor liquid enough for the consideration of serious poker players, especially as moving money to and from international poker sites will continue to become more and more difficult until the U.S. changes its laws. Even if the indicted sites go on to win in court and to clear themselves of all charges, which would allow them to resume their U.S.-facing business, this will take years. So, basically, for now and for the immediate future, online poker no longer exists in America. Americans will continue to be unable to access their balances with these sites for some time. While historical precedent and most of the informed legal opinions I've read say that the players will get their money back eventually (possibly years), there's some chance that these funds are permanently seized by the DOJ due to the nature of the fraud charges or otherwise lost due to a future bankruptcy of these one-time giant global poker companies. Having read many different perspectives on this complex legal situation, I think there's at least a 95% chance that U.S. players will eventually get back their money. edit: Just now, a DOJ press release confirmed that the DOJ is looking to allow the sites to return players' money in an expedient manner, so upgrade this to 99%. Tens of thousands of American online poker pros are essentially out of a job (I do not expect the general public to sympathize with this). Millions more American gamers have lost the opportunity to conveniently and efficiently play the game that they love and responsibly enjoy. Those few that are addicted to gambling on poker will continue to play at the remaining unsafe sites. For both professional and recreational players, replacing online poker with live, brick-and-mortar poker at U.S. casinos is rarely an option, due geographical concerns as well as a variety of economic and efficiency reasons. Serious players will have few options for practicing and improving their game, and the rest of the world will pull ahead of America at competitive poker. The entire modern global poker industry of the past several years has been built upon PokerStars and Full Tilt Poker, and the damage done to these two big online sites will have effects on the entire world of poker. Some poker tournament circuits and televised poker programs have already been cancelled, and countless more industry and media jobs will be disappearing as the poker economy contracts. I expect that this amounts to thousands of "real-life" jobs lost for Americans. The same negative effects will also carry over into other countries to some extent, as international players will have lost the ability to compete in a fully global player pool. When the indictments are resolved, hopefully the illegal gambling charges are addressed in a way that leads to a court case that definitively establishes that poker is not unlawful gambling under U.S. law. Depending on who you ask, the illegal gambling charges are somewhere in between a real stretch legally and purely frivolous or just for show. However, the bank fraud charges are severe, and while not necessarily an unwinnable battle for the poker sites, it looks pretty bad for them — though, as I noted earlier, some say that the nature of whether or not fraud was committed does depend in some way upon whether or not the underlying operations were illegal gambling. Nonetheless, because of the severity of the bank fraud charges, the full set of indictments may be settled out-of-court, which would be a tremendous loss for the game of poker. The silver lining in this catastrophe is the opportunity for poker to finally get its day in court, and I hope that those associated with PokerStars and Full Tilt Poker will push for this. The other possible silver lining would be if this indictment sped up the process of passing U.S. legislation to allow for domestic licensing of online poker. Some speculate that it will help compel U.S. interests to work towards it faster, as domestic casino companies will no longer need to worry about competing with established international sites for the U.S. player base. Others expect the controversy of this event to dissuade our elected representatives from embracing anything related to online poker. There does not seem to be a consensus. While I knew this day was likely to come at any moment in the past 4.5 years, and while I managed my money and planned my poker career accordingly, that hasn't made it easy to handle. I play the vast majority of my poker online and will not be able to replace it with live poker to any meaningful degree. Moving to another country to play online poker would be incompatible with the rest of my life. This affects not only my finances, but also my happiness and life balance. Poker has been invaluable to me over the years as a unique outlet for mental exercise, strategic competition, and social interaction, all while being an excellent complement to my academic lifestyle. Over the past few days, it has really sunk in that I truly do value the game on these merits, rather than solely as an income source. The entire premise of the government's various aggressive actions against online poker as "gambling", as well as society's refusal to properly treat poker the way identically-structured strategy games are treated, is something I have always taken serious issue with. This event is the culmination of a decade of ignorant and misguided policy towards my game, and it really hurts. I was prepared for this and I'll be okay, but this is life-changing for me — and not in any good ways. If you have any interest in supporting the game of poker, the rights of competitive strategy gamers, or even just in supporting this because it is important to me, I would encourage you to take a look at the PPA's action plan and contact some of our elected representatives. While the charges against these particular poker sites may be legitimate, now that the perceived "bad actors" would be out of the picture anyway, this is an opportunity to gather support for U.S. legislation that will license and domestically regulate online poker. The government needs to hear that millions of its citizens are being negatively impacted by its policies towards online poker, and that its citizens deserve the consumer protections of a safe and explicitly-legal online poker landscape. The poker world will never be the same as it was prior to Friday, but it will inevitably be rebuilt sometime in the next few years. The second, permanent era of online poker will emerge in a way that suits the interests of U.S. politicians and powerful domestic casino interests. This is discouraging at best, but it's the way laws get changed. As far as the health of poker and its players are concerned: the sooner it happens, the better. Every day in which well-minded, law-abiding, tax-paying Americans don't have access to compete at online poker is an undue intrusion into personal liberties and an insult to the integrity of this great game. That's it for now. In general, this blog will continue, as most of my planned future topics were not entirely confined to online poker.